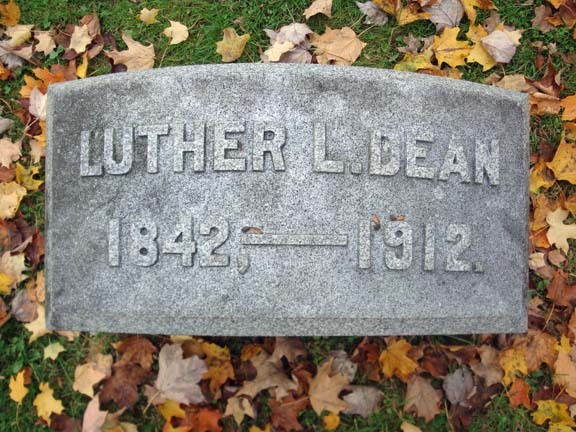 LUTHER L. DEAN was born in Port Jackson (now the fifth ward of Amsterdam), on the 8th day of June, 1842. His father was Daniel Dean, a native of the town of Florida, Montgomery county, who passed most of his life as a shoe dealer in Port Jackson. He married Miss A. E. N Lyon, of Essex county, N. J., and they had three children — the subject of this sketch, who was the eldest; one son who died in infancy; Malissa B., now the wife of N. C. Becker, of Amsterdam. Daniel Dean died on the 15th of June, 1879, ^^^ his widow is still living. Luther L. Dean’s grandfather was Bethuel Dean, who married Margaret Phillips, of Florida, where they were among the early settlers. 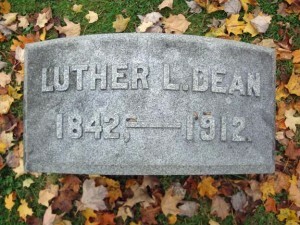 Luther L. Dean was, at an early age, thrown upon his own resources. After a period at the district school he finished his studies in the Amsterdam Academy, which he attended until he was fourteen years of age (1856), when he entered the dry goods store of Gardiner Blood in Amsterdam and served as clerk four years. He then went into the Farmers’ Bank and served as book-keeper four years and one month. These eight years of business experience and faithful application to the interests of his employers gave him confidence in himself and a reputation in the vicinity for industry and integrity which were of great value to him in after years. Associating himself with Alonzo A. De Forest, then employed in the Farmers’ Bank, they purchased the hardware stock of J. Warring & Son in Amsterdam. Mr. Dean took entire charge of this business and under his energetic and prudent management it was rapidly in- creased. At the end of fifteen months Mr. De Forest sold his interest to David McCowatt, the firm style becoming Dean & McCowatt, and the business was thus conducted two years and a quarter, when their lease expired. During this three years the business had been increased from $10,000 to $30,000, and the firm found it impossible to get a renewal of their lease. A sale was, therefore, made back to Warring & Son, Mr. McCowatt remaining with them in the business. This brings the record down to 1868, when Mr. Dean purchased the hardware stock of E. T. Leavenworth and associated with himself James P. Visscher, under the firm name of Dean & Visscher. 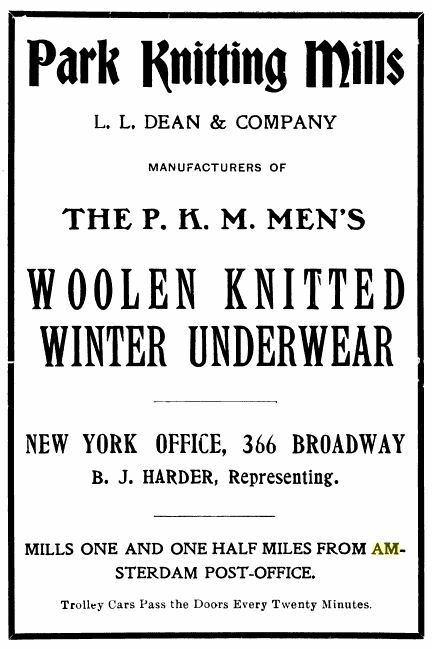 This connection continued eight years until 1876, when Mr. Visscher died, and Mr. Dean took in John E. Larrabee as a partner ; he had been for eight years a clerk in the store. 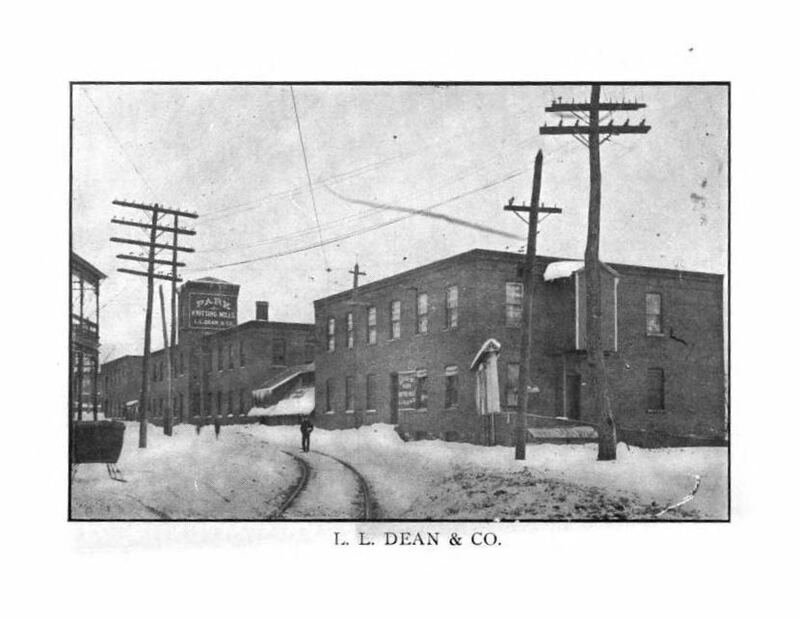 The firm name for the next six years was L, L. Dean & Co., and when, in 1882, Mr. Dean sold out to Larrabee & Barnes, the business had been pushed up to $60,000 a year. 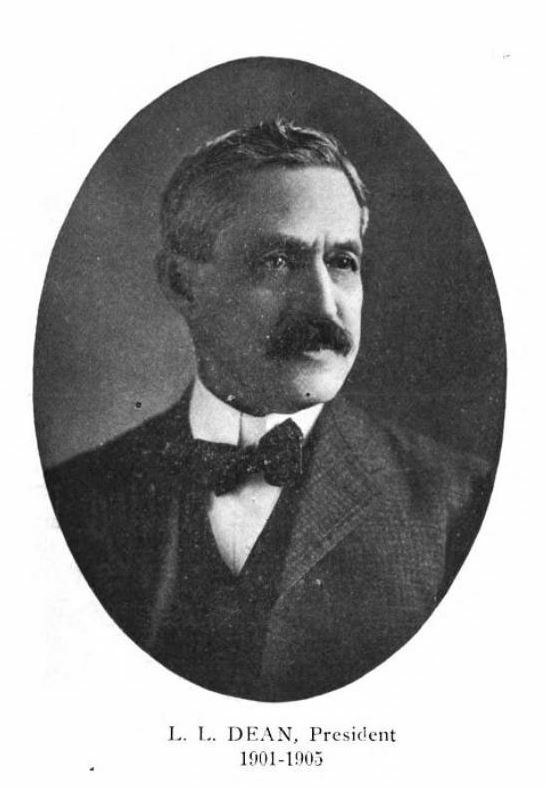 After twenty- five years of persevering industry in active business life, in which Mr. Dean had not only been eminently successful in a material sense, but had won from the entire community that unlimited confidence and warm friend- ship which follow only upon years of honorable effort, he retired for a brief rest of six months. 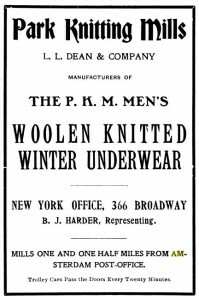 In January, 1883, Mr. Dean, associated with W. R. McCowatt, bought out Oscar F. Nelson and Willie B. Neilson, of the Metropolitan knitting- mill, and operated it un’der the firm name of McCowatt & Dean for three years, when he sold out to Thomas Little and George B. Stover. 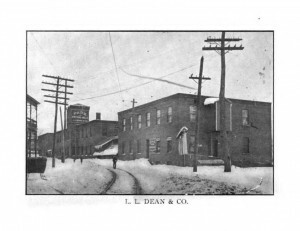 Meanwhile and some years earlier, the idle mill building which is now occupied by L. L. Dean & Co., had come into possession of the former hardware firm, and in 1866 Mr. Dean associated with himself his brother-in-law, James T. Clark, and his cousin, Isaac E. Lyon, of Newark, N. J., fitted up the mill with knitting machinery of the first class, making it one of the finest establishments of the kind in the country, gave it the name of ” Park Knitting Mills,” and have since carried on the business in a most successful manner. Such is a brief record of Mr. Dean’s business career, and it may be closed with the statement that in every sense it has been an honor to him. Mr. Dean is an uncompromising Republican in politics, but has not aspired to office of any kind. He has, however, received many evidences of the confidence of the community through selection and appointment to various posts of trust and responsibility. He has held the office of trustee of the village three years ; was assessor three years, and was one of the persons named in the original bill creating the sewer commission of Amsterdam, a body who built one of the most complete and effective sewer systems in the country, providing twenty-four miles of sewers at a cost of $240,000, where engineers’ estimates for fifteen miles reached $268,000. Moreover, the bonds of the city were floated at three per cent., largely through the efforts of Mr. Dean, and in the face of often repeated predictions of moneyed men that it could not be done. Mr. Dean is one of the originators and a director of the Amsterdam City Bank ; was one of the founders and vice-president of the Amsterdam Savings Bank, founded in the face of strong opposition, an institution which now has $450,000 on deposit. He was one of the originators and a director in the Amsterdam Board of Trade ; one of the originators and a director in the Amsterdam Library Association ; treasurer of board of trustees and trustee of the Young Men’s Christian Association, and has been its president at three different periods. He has been an elder in the Reformed Church many years and superintendent of its Sunday-school thirteen years. This record speaks for itself arid needs little comment from the biographer. Starting at the foot of the ladder in life, Mr. Dean has attained a position among the foremost representative citizens of the community. Mr. Dean was married June 17, 1863, to Mary S. Clark, daughter of the late James A. Clark, of Amsterdam. They have one daughter Fanny, born September 26, 1876. They have had three sons, all of whom are deceased.